As some of you know, my once slim body was horrible changed by a dreadful bout with the acid reflux drug "Previcid" a few years ago. Weight gain was listed as one of the side effects. What the warning didn't say was that the weight gain was extreme and rapid and a huge health risk. I put on over three stone (nearly FIFTY pounds!) in two months. I never changed my diet. Throughout the whole affair, I was eating my usual near vegan diet-about 1500-1600 calories a day and was my usual moderately active self. When I went off the drug, my weight gradually started coming back down. 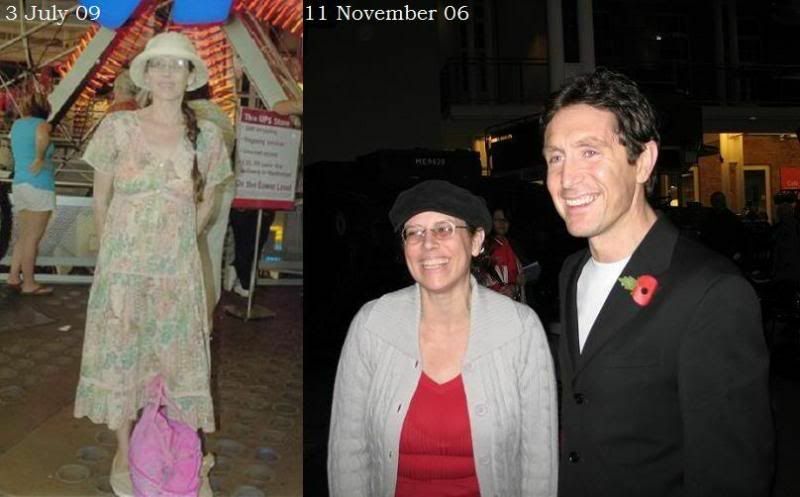 At the peak of the horror-and very embarrassingly at the Poppies premiere, I weighed an ungodly 154 lbs.! WAY too much for my tiny-ish 5'2" small-framed body. My wrists are just under 5 1/2 inches around and my rings sizes range from 7 (right thumb) to 3 1/2 (left pinkie). So to have to wear an American size 14/English size 18 was a nightmare to say the least. I also suffered a number of other weight-related side effects. It was a horrible time. So, today, I am glad to be back to my normal weight-107 as of this morning, and wearing my normal sizes-1 to 2 American and English size 6. And, above all, MUCH healthier! Never want anything like that to ever happen again!